Drew and Chas of Fullerton's Team Velocity sponsored by Bannings Bikes trained for the upcoming 2010 San Dimas Stage Race on Sunday afternoon. Drew a Cat 4 Division rider hoped that Chas would enjoy the sweet ride of Glendora Mountain Road and sign on as well. My Amgen Tour of California t-shirt along with carrying a Canon T1i (500D) SLR camera and shouting "I'm practicing" gained the attention of many along the road. 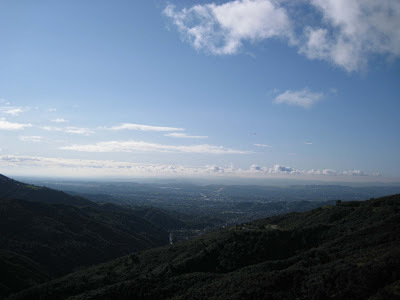 If you biked along the Monroe or Mystic Canyon on Sunday 2/28/2010 between 8-10 am or you biked Glendora Mountain Road between 12:20 and 3:30 pm this afternoon look over the photos in the slideshow. The pictures were slimmed down from their 6-7 Mbyte size. 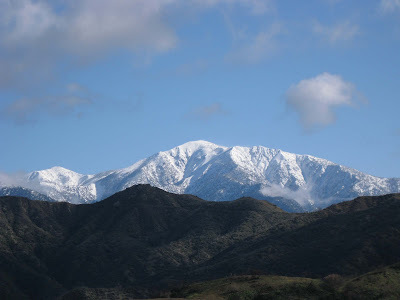 If you inquire to GMR I might be enticed to send you the full size photo. After a 2-3 mile hike in the morning and a 7 mile hike in the afternoon the body said REST. Support an athlete with the warmth of your home. Riders from Colorado, Georgia, Pennsylvania, Missouri, New Jersey, Arizona, Oregon, Idaho, Michigan, Massachusetts and all over California need a place to crash for two or three nights during the San Dimas Stage Race. Times are tough and a spare bed, couch or family room accommodations would make a big difference to these friends in need. Contact GMR or the San Dimas Host Housing Director. You don't even have to ride a bike to host an athlete in your home. Weathermen predicted a rain storm tomorrow. The walk home from the dental appointment was surprisingly warm at 65F. A fire burned in a neighbor's chimney. Come outside and feel the warmth! Take advantage of our gentle climate. I started my ride around 10:30am and the sun streamed down through the high level cloud layer. Good to sweat. A mountain biker was easy to catch and bring out my competitive streak in the flat section after the electronic sign. An occasional cyclist headed down passed me by. A bit more motor traffic going up. Around mile marker 11, I noticed a motorcyclist with red hair and an orange backpack cruise past me checking their rear view mirrors. Nah that couldn't be ... the hair was too red and the rider wasn't orange enough. No one I recognized. Twenty minutes later I stopped at an odd turnout closer to Newman's to munch the gel bites I had. The same motorcyclist headed down the mountain slowed to a stop. Then the recognition happened, brain cells lighting up while the other half were in absolute denial. No way. My sister Renee laughed. 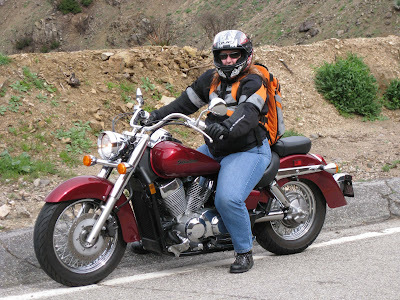 It was her first time in a long time on her bike on the mountain. 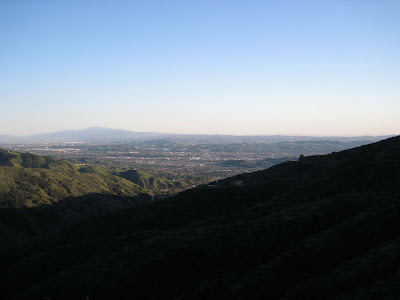 After chatting with my sister Renee, I continued to the top of Monroe. The vista clearer than Saturday. The hillsides in the canyon looked like Ireland lush and vibrant. 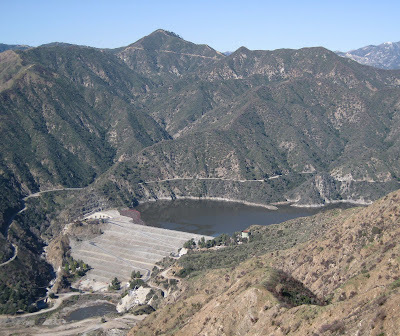 The San Gabriel Reservoir full to the top. Adam of Pomona College asked me for tips for a successful ride from Claremont to GMR to GRR and down Baldy Road for today. I hope he enjoyed the great winter weather. Windy. Enough to blow the bike around. Thoughts of turning around and going back every ten minutes flashed through the brain. Kept on pedaling. A few hardy souls coming down the mountain. Areas of the mountain that are normally windy weren't all all the rest were challenging. Ben of Azusa Pacific University breezed uphill at a high cadence against the wind! Amazing. Met Wade, Matt and Nick of SC Velo at the top. Saw them again at the SC Velo meeting at 7 pm. Matt said it was the first time since summer and the Morris fire that he was on GMR. Mt Wilson had good climbs when the forest was closed. We discussed whether tonight was colder than Saturday? 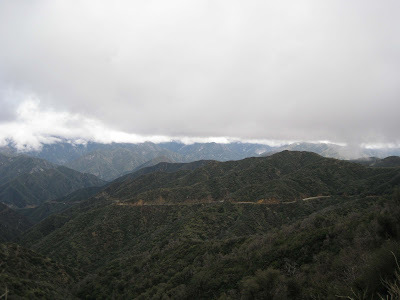 Lets review: Saturday I had farther to descend, clouds, humidity and no ski gloves. Tonight shorter descent, drier, the setting sun, and ski gloves. My toes and fingers voted for Saturday as the colder ride. But tonight the foot cramp and keeping upright from the gusts of wind made the ride more difficult. And yes I would do it all over again! The rain of Friday night was meager but just enough to dampen the streets and the spirits of would be recreationists. Saturday morning was clear with a few clouds. The temperature was cold a mere 45F when compared to the summer like temperatures of of the days prior that peaked in the 80s. Only the very hardy ventured out onto the road this Saturday morning. The wardrobe changed from shorts and short sleeves to full winter regalia. Jason needed to ride after a three week hiatus and his usual cadre of friends were a bit wiser staying in the comfort of their heated homes. It was sunny on the way up to the first saddle. Patches of the road were dry. The view to the north was spectacular. The view to the south was promising as well. The cloud bank looked faraway and nonthreatening. Jason and I stopped took photos and munched at the first saddle. Sun felt good and warm. The towers of downtown LA were visible without the normal blanket of brown air. By the time we got to the top of Monroe the storm system had covered Baldy Village. The clouds had rolled in, the temperature dropped and it was downright chilly. The back thigh complained as I approached the shed. It was cold. This winter-summer-winter routine confused both the body and the brain. The clouds encroached Little Dalton Canyon as well. Back at the shed we met Mohammed from East Los Angeles who rode from Whittier up San Gabriel River Trail up Highway 39 and down GMR. 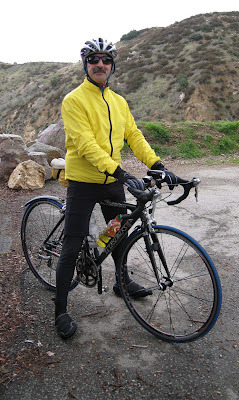 He was training for the Solvang Century March 13th. Awesome dude. Good Luck! The traffic was extremely light for a Saturday. On the way up two cars passed us. One motorcycle. One cyclist going up. Three cyclists coming down. We braced for the downhill chills. I had a dry base layer, leg warmers. I missed the ski gloves. Could have used another jacket as well. The fingers felt the cold first. Jason was dressed lighter and really felt the cold. His goosebumps spoke volumes. We stopped to warm up at one point. Jason met up with a fellow mountain biker riding a road bike, Rick who was ready for a 300 mile ride. Rick had calf muscles that put professional cyclists to shame. Arriving home, having consumed calories on the road, my body had a different set of priorities than after the Monday ride. First, my body said WARMTH. The hot shower was wonderful. I could feel blood flow in my left toe again. I definitely didn't feel starved from the shorter ride, but I munched a left over taco from Friday night anyway. Then the body said SLEEP. I obeyed with a short nap. Beautiful vistas, an okay SDSR time, good company, a good ride. The environment, clouds, rainfall, cold were the hurdles for the weekend. Downright cloudy this morning I managed to avoid the wetness on a short hike up Mystic. Four mountain bikers were at the "Y" where Mystic, Poop-Out and Monroe Trails come together. 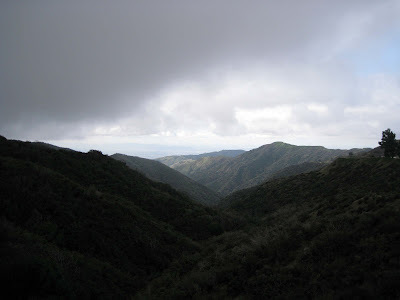 Full of stories of Chino trails with mustard plants four feet tall, their brush with fate was a trip up Marshall Canyon. Riding in Marshall Canyon a couple of hikers had surprised them as they stepped out from the shrubs and chatted. Wanting to get on with their ride they headed up the path to see a newly fallen oak tree. The delay on the trail with the hikers had saved their lives. Took a short cut down a section of Poop-out. 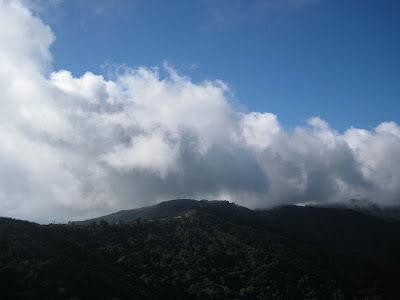 The clouds were low over GMR. Met Richard from Rio Hondo Roadrunners performing trail maintenance. A shrub and hillside shown behind him slide down covering the trail forcing bikers and hikers to make a new path. 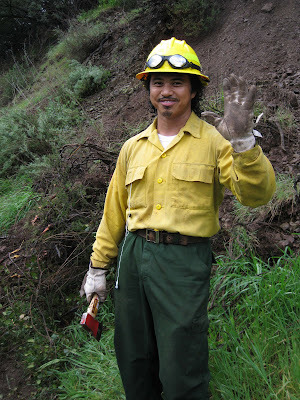 Of note, Richard was one of the first responders on the Morris Fire. He was thanked heartily. Driving out on Big Dalton Canyon the rain started before I got to the gate. I missed getting wet by mere minutes! I threw on the summer base layer and short sleeve jersey. Shivered. Then put on the lightest winter base layer and long sleeve jersey. Sweated. Back to the summer base layer and short sleeve jersey. Yep just right. Got on the road early before the snow seekers came out in force in their minivans and trucks. I wanted to go farther with the warmer weather. 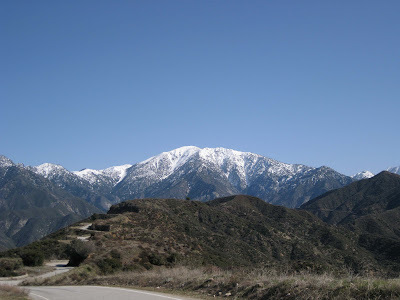 The gate to Glendora Ridge Road was open and the pedals kept turning. I stopped at Fork plus Six. The last time I had been this far was July 3rd! One cyclist who made it to Baldy Village said it was a mad house. Getting back over the four hills then up the fork the body said its been a long time, it was good to be going down hill. I had plenty of liquids for a longer ride. Next time more food. I was starved when I got home. An eclectic assortment of calories disappeared into my mouth with the emphasis of Now being a bit too late. One slice leftover pizza, half a toasted peanut butter sandwich whole grain bread, slice of cheddar cheese on whole grain bread, banana, water, milk with a dash of whey. Once sated the body said sleep. Nirvana. A long ride, in good weather, time to get the legs back in shape. Fast hike up and back on the upper Mystic Canyon trail. On the way up, stopped and chatted with a mountain biker new to the trail who worked at Bonelli Park as a lifeguard. On the way down passed three runners from the Southern California DayBreakers. Scoping out Bonelli Park in the afternoon for the best vantage points for the San Dimas Stage Race, Bill and I sought out the shade and water rather than beat the pavement. Bonnie and Gary a local couple spotted an eagle as it wrangled a fish from the water and deposited its catch atop of a group of trees. A mate or nest perhaps? A second glorious day to a three day weekend. Lots of walk time today. 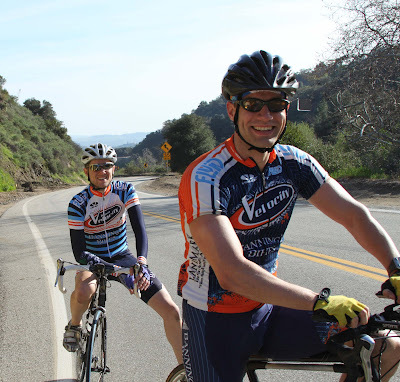 On Saturday's ride, I met up with Brian and Bob from SC Velo who plan on riding in the San Dimas Stage Race. One of the smaller coyotes from Wednesday trotted along the berm of the road. Quietly it disappeared into the brush while Brian and Bob pushed along on their ride. It was warm enough to entice me to ride beyond the shed, beyond the top of Monroe. Glendora Ridge Road gate was locked. Closed due to snow and ice. Sheer heaven as I hopped over the gate and relaxed as I pedaled on the road. The sun was bright and the sky was clear. I stopped near the Experimental Forest sign two miles in. On my way back I noticed that all the cyclists had huge grins on their faces. Beautiful weather and closed road. A number of recent studies also have shown that, among athletes who train outside year-round, maximal oxygen intake tends to be highest in late summer . . . The athletes, in other words, are fittest in August, when ultraviolet radiation from the sun is near its zenith. They often then experience an abrupt drop in maximal oxygen intake, beginning as early as September, even though they continue to train just as hard. This decline coincides with the autumnal lengthening of the angle of sunlight. Less ultraviolet radiation reaches the earth and, apparently, sports performance suffers. It definitely describes my performance level. One last stop on the way down at Newman's Point showed the reservoir at its highest level over the course of a year. Little evidence of the Tuesday's storm was left. 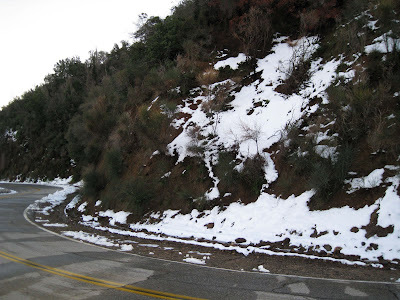 Folks driving around looking for snow on Glendora Mountain Road were woefully disappointed. Only a few tiny patches lasted in the shade and had a foamy appearance. Ray Clone captured this stunning panorama of Baldy Village on Wednesday 02/10/2010. The gate was closed at 4:00 pm and open at 6:00 pm. 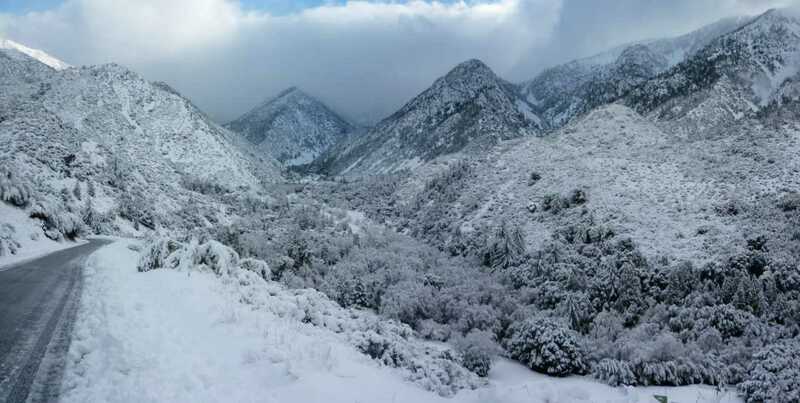 The US Forest Service personnel who stopped to unlock and relock the gate to allow their vehicle to pass said the "County" had closed the road for the day due to snow and ice. The wildlife aware of the quiet on the road owned the forest today. Zoned when I ride, I see about twelve inches of road in front of my tire. 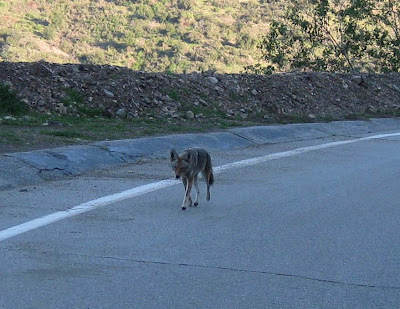 Between mile marker 11.39 and 11.25, I glanced up and noticed I was amidst a coyote pack. Three coyotes cold and hungry strolled along on the road deciding if handouts were available. One was larger and two were smaller possibly yearlings now of the cubs last spring. This coyote had one blue eye and one brown eye. Electronics can be exceedingly slow in the moment. 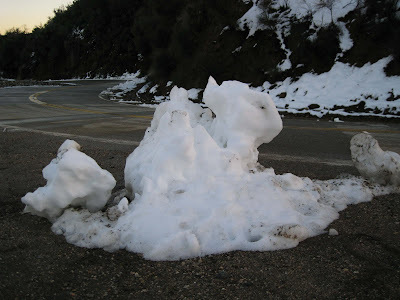 The real allure of the ride was the rain from Tuesday cold and low enough to leave snow at the 3,000 foot level. 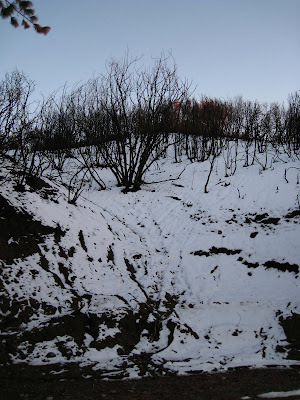 Burned trees blanketed in white. Cold on the way down. My toes and fingers are now toasty warm. Rained out of my Saturday ride, I couldn't get on the bike fast enough on Sunday morning even though it was a brisk 41F. The road was dry with patches of silty sand along the way. Everything was passable. Not many rocks. Motor traffic was light but I did get a bit of surprise when a Suburban-asaurus passed me by with eight inches to spare. 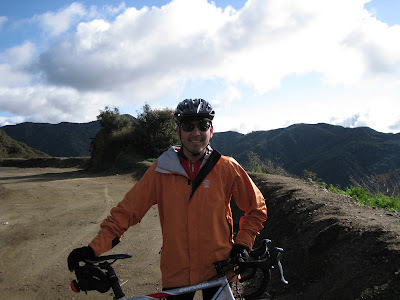 At the top of Monroe met Chris a Mechanical Engineer Grad student at Caltech. His buddies were busy comparing their power output from their Cycleops Powertap units and calculating their power to weight ratios. The clouds rolled in quietly and the temperature dropped and they as left for the ride down his one buddy graciously offered to carry everyone's jackets. I needed all of my layers and then some. I stopped and met Richard and Curt. Richard's wife is a host at the Mt. Baldy Hut and he had tales of hiking in the roof for the hut. A two and half mile hike. Ready to go? Frank and I crossed paths back in September when the forest was closed and I was doing short rides familiarizing myself to the ins and outs and cleats. 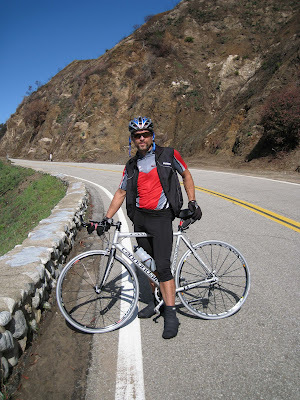 Frank rides the San Gabriel River Trail and loops downtown before heading up Sierra Madre to Glendora Mountain Road. Frank likes to warm up for 20 miles on the flats before he hits the hills. Round trips are 65 to 70 miles on his Cannondale Caad 8 bike. Need an event to kick off the start of your cycling season? 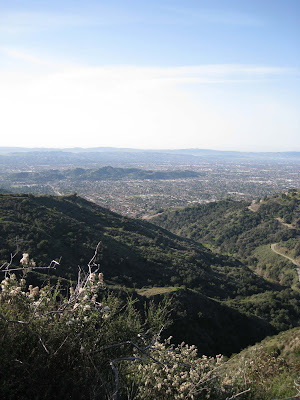 The San Dimas Stage Race is coming March 19-21. Hosted by SC Velo registration is open and spots are available. The flyer provides start times, laps and field limits. World class professional, state champions and talented amateur cyclists from around the world are once again gearing up to compete in the 11th annual San Dimas Stage Race. The race, hosted by local bike club SC Velo, is scheduled for March 19th, 20th, and 21st. Three exciting stages of racing are planned as well as the Kids Race on the last day. Over 800 amateur and pro cyclists are expected to compete for cash and prizes. The San Dimas Stage Race has grown and matured from its modest beginning in 2000, to become a well regarded race by the cycling community. Stage 1 consists of individual time trials on a 3.8 mile course that winds its way up Glendora Mountain Road. Sponsored by Glendora Chevrolet, this stage is an individual all out effort by the riders to get the best time going up the steepest and curviest part of Glendora Mountain Road. With the size of the field, it will be a long day of racing, with the first rider starting at 9:00 AM and the last one going out in the late afternoon, the exact time being dependent on the number of riders. Stage 2 will be a Road Race around Bonelli Park. This stage is sponsored by San Dimas Hospital. 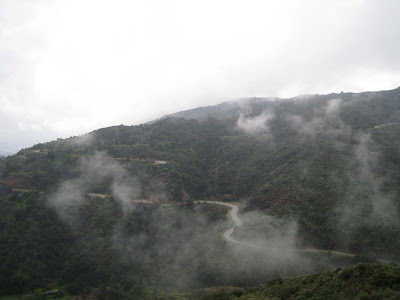 The course is made up of a rolling and twisting 7 mile circuit which includes a couple of short, but steep, grades. The riders will make several loops around the course, with the overall racing distances varying from 35 to 84 miles, depending upon their category. The first group will start at 7:55 AM and the last group will start at 1:15 PM. 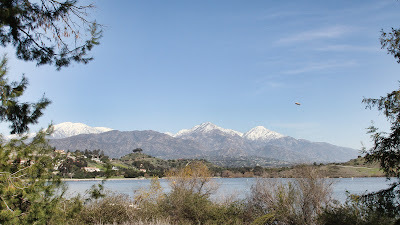 The best spots for viewing the race will be along Puddingstone Ave, which is where the Start/Finish Line will be, and inside Bonelli Park along Via Verde. Stage 3 will be a Criterium around the streets of Old Town San Dimas. Sponsored by Incycle bike stores and Cannondale bikes, the racers will ride quick loops around a tight, 1.2 mile circuit with 6 sharp corners, for times varying from 30 to 90 minutes depending upon their category. The first group will start at 8:45 AM and the last group will start at 3:00 PM. For spectators, this will be an up-close and fast race, with lots of good viewing spots around the course. The Kids Race will be a fun event hosted on Sunday March 21st at 12:300 PM in downtown San Dimas. Sponsored by Shimano, the race is free to all children, so get your kids’ bikes out and ready to ride. Please note that helmets are mandatory. All of these events offer great opportunities for participation by cyclists of all levels from recreational to professional, as well as wonderful viewing for cycling fans. There is no fee for watching, just pick a spot along the race route and be prepared to see some exciting racing. For the photographically inclined, the photo-ops will be unparalleled, with lots of up-close action, so bring your cameras. For more information about the race please go to www.scvelo.com. Registration is open and spots are available online. I want to clean up the right column of the website and I don't want to loose this valuable historical data. Closed 07/30/2011 - Hazmat Team cleanup at mile marker 11.97 three containers leaking gas. Closed 7/30/2011 -- 1:00 PM - 8:00 PM - Hazardous materials at 11.97. Hazmat team called. Last closure: 8/25/2009 to 09/30/2009 Forest Closure. Morris and Station Fires. Hwy 39: Last checked 03/27/2011 by Steve P.